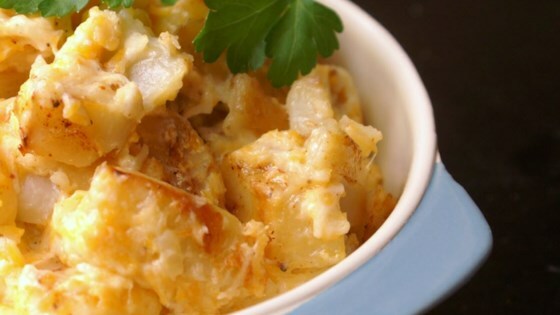 "This is a delicious side dish with cheese, potatoes, and Ranch! What's not to love?! I am always begged to bring this wherever I go. It is a great complement to a barbeque or any potluck meal. I have experimented with using more chili powder and using seasoning salt instead of regular salt." Place the potatoes in the baking dish. Season with chili powder, salt, and pepper. Evenly distribute the butter over the potatoes. Cover dish with aluminum foil, and bake 1 hour in the preheated oven, until potatoes are tender. Remove from oven, and mix in the cheese and Ranch dressing. Continue cooking 10 minutes, or until cheese is melted and bubbly.